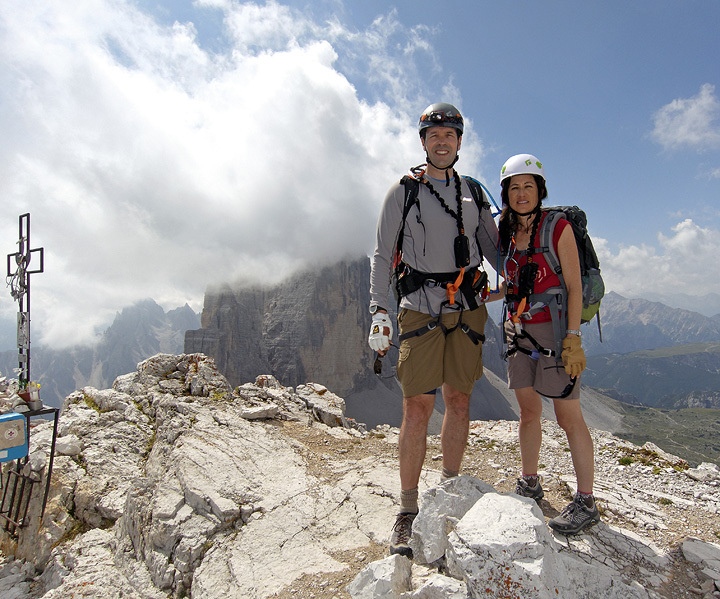 Ten long years ago John and Lori came to the Alps and did some climbing with Kathy. 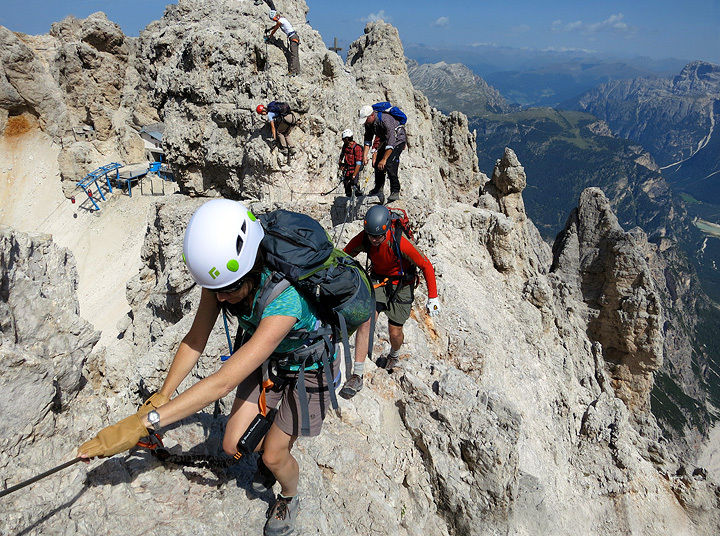 They were back this summer, this time to try out some of the world famous "via ferrate" in the Dolomites. 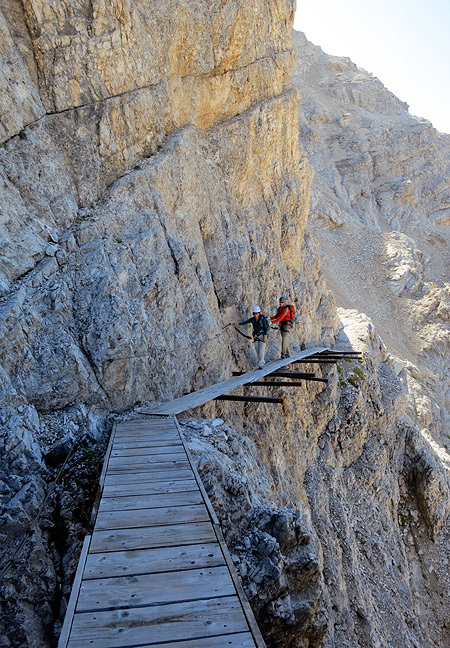 The system of Via Ferrata in the Dolomites has become increasingly developed and popular over the years. 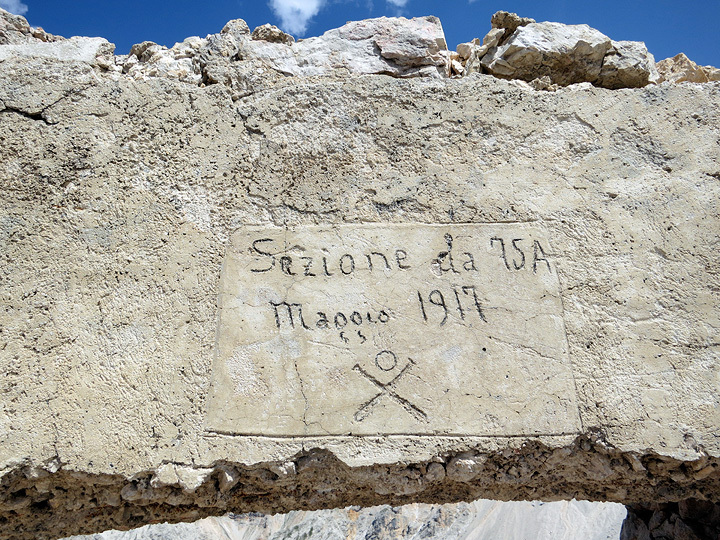 Many date back to the first World War, and were built and used by soldiers of both the Austrian and Italian sides in their struggle to control this region. 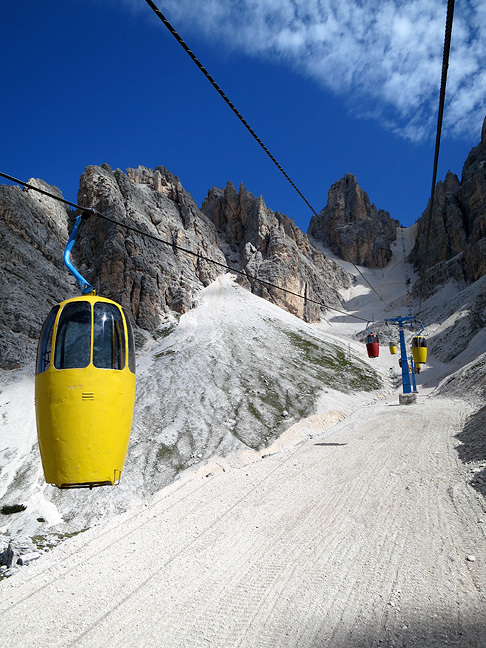 In modern times many more have been added, extended and reinforced for the enjoyment of mountain lovers, so that today there are literally hundreds of these "muscle powered fun rides" throughout the Dolomites. 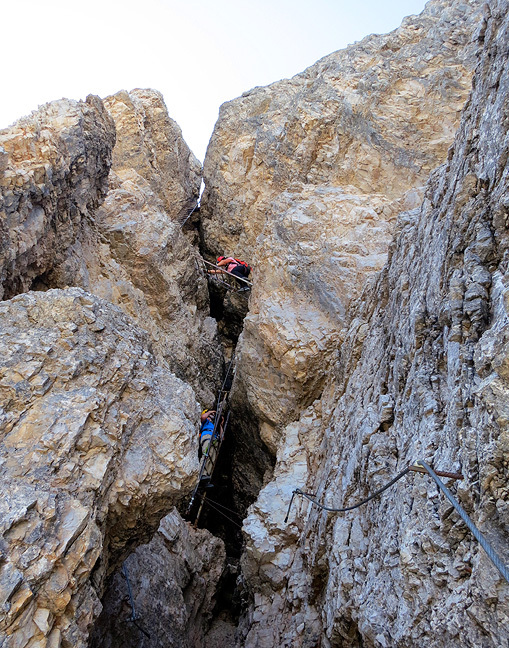 They allow access to remote and exciting situations and summits, while the cables, ladders and occasional bridges facilitate climbing without the need for traditional rock climbing equipment and techniques. 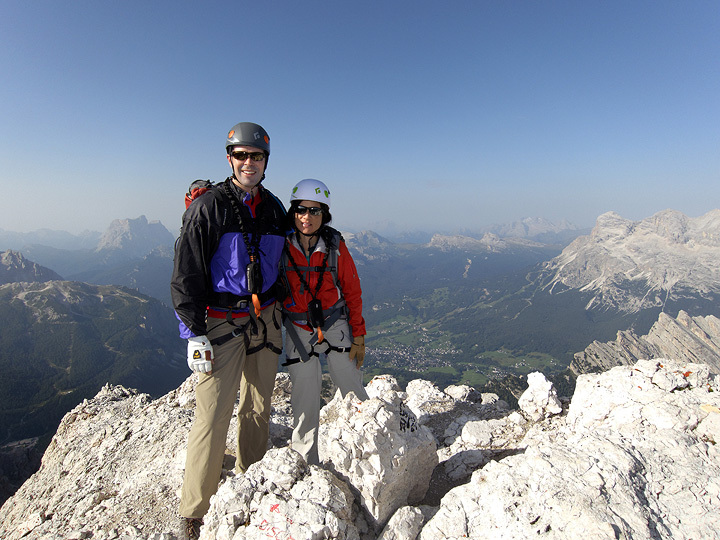 John and Lori on the summit of Cristallo, our third peak of the week. 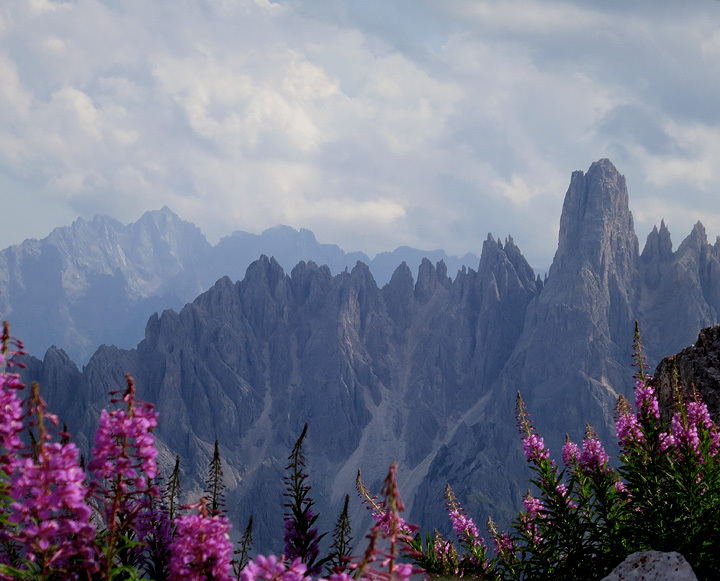 We started with Averau, shown here, near the Falzarego Pass. A relatively short route, it was a good introduction to the use of the equipment, to efficient climbing technique, and to the occasional sense of exposure. 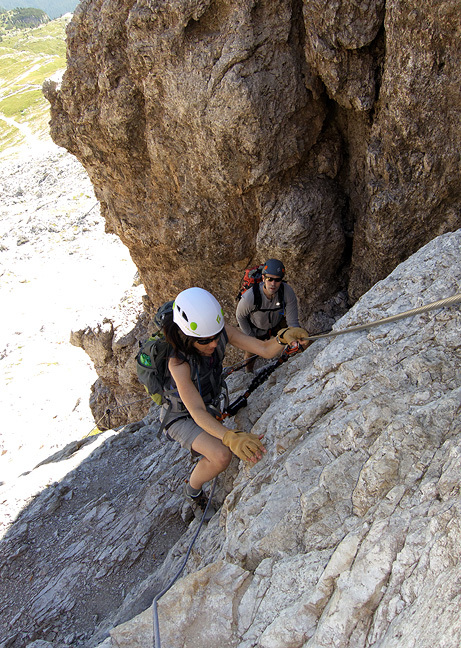 Lori pulls some strenuous moves on small footholds. 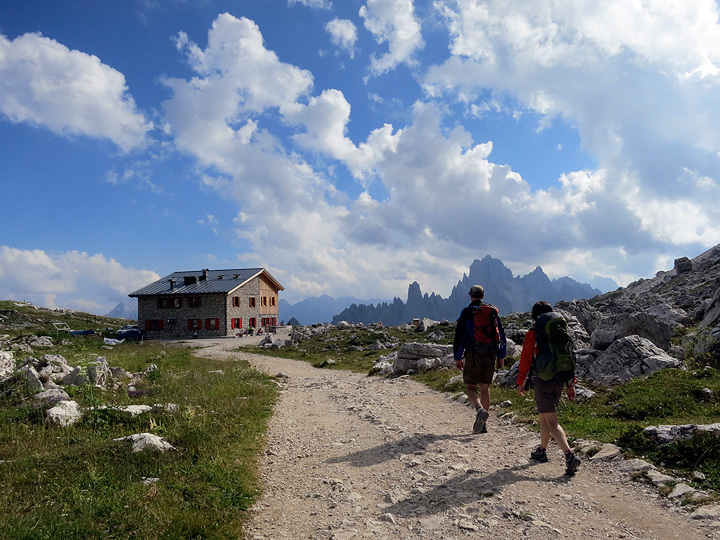 The next day we moved up to the Rifugio Lorenzi, where a night spent at 3000 meters allowed us to do two longer routes without time pressure. Our day began with a long, slow ride on these ... interesting 2-passenger cable cars from waaaaay back. Still running though! 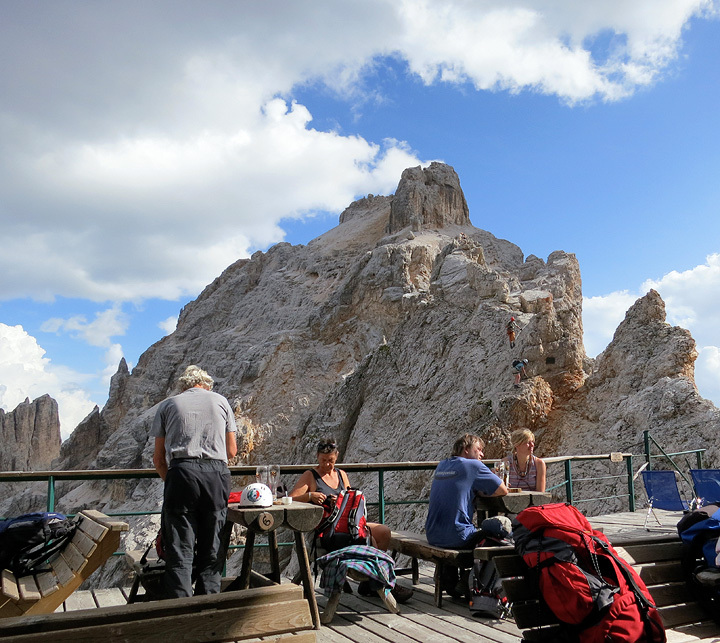 Our first route, Cima di Mezzo, leaves directly from the terrace of the hut. In this shot, ferratists rest after their labors and have a drink before heading back to town, while the last stragglers come down off the peak. Starting out from the hut, it's definitely more air than on our previous day! 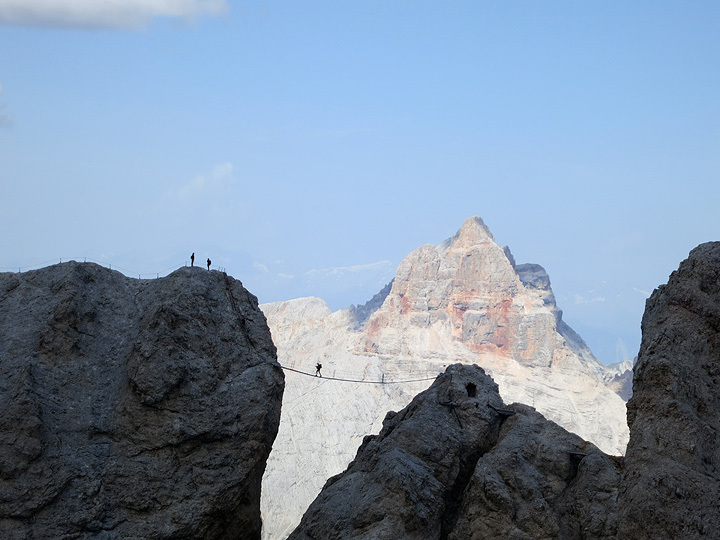 We get a good view across at the longest bridge in the Dolomites, on the Ivano Dibona route, which we will do the next day. 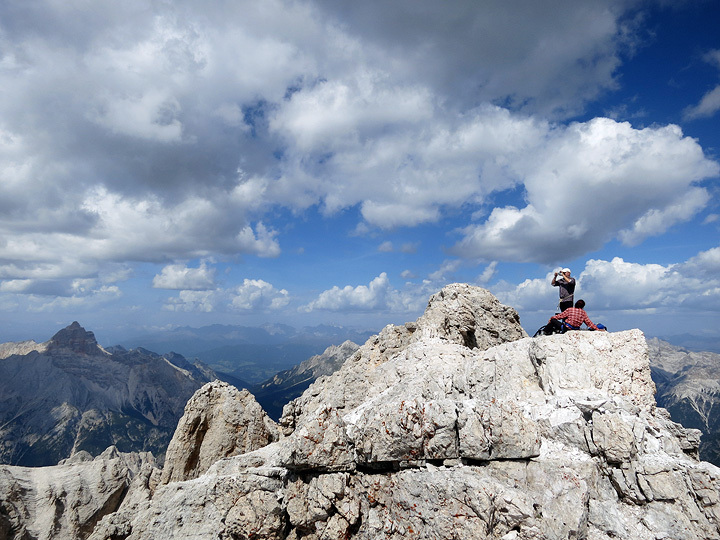 Enjoying lovely views from the top of the Cima di Mezzo. 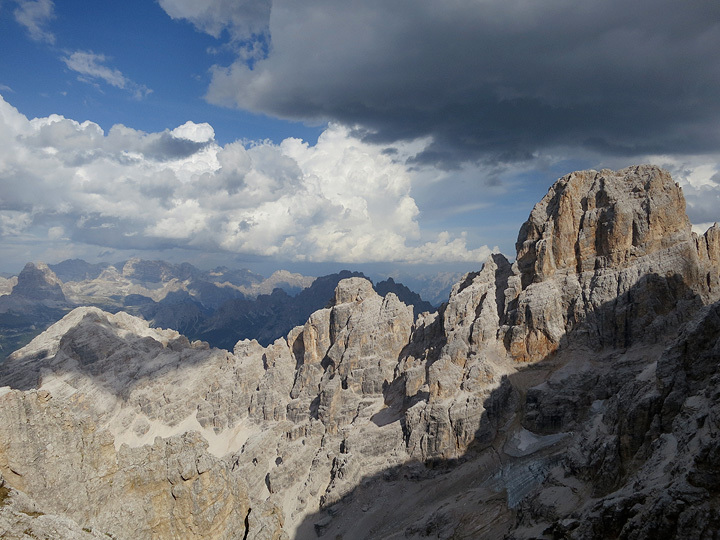 Back at the hut, threatening weather moves in toward sunset. The rain moves closer... but didn't really kick in until after midnight. 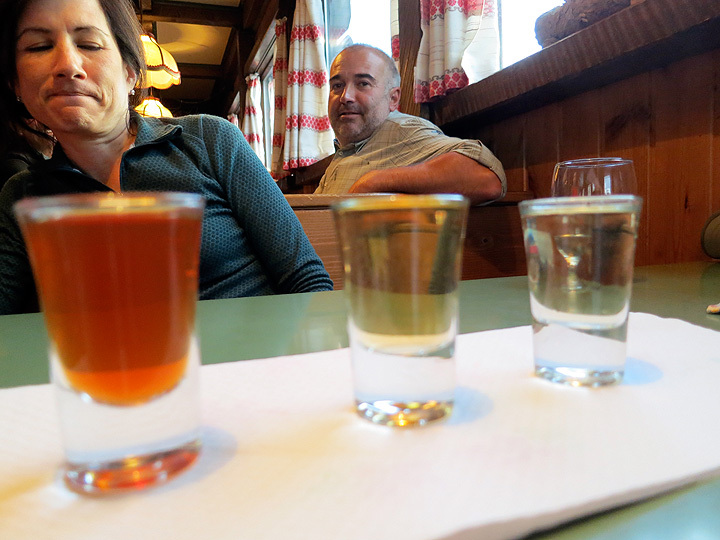 We decided to sample three home-made grappas as a "digestif" after dinner. Lori looks very skeptical, while our neighbor finds it funny and touristic that we are taking pictures rather than just knocking it back. From left to right are cinnamon, pine, and larch flavors. The latter two were... subtle. 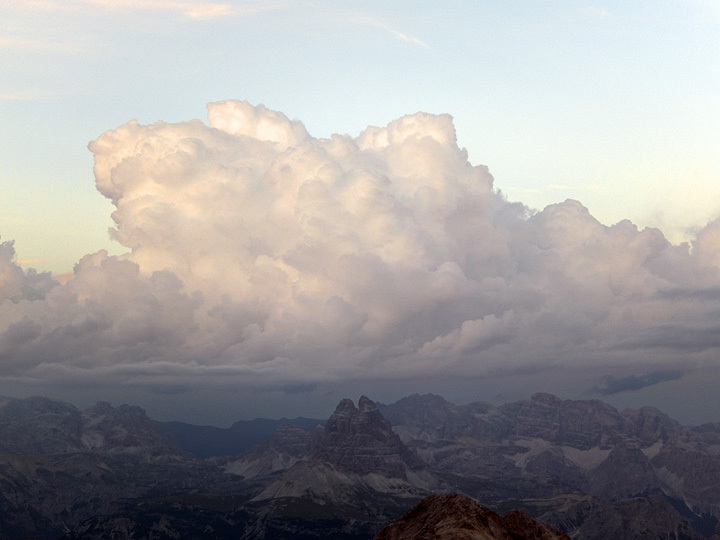 Sunrise at the Rifugio Lorenzi. 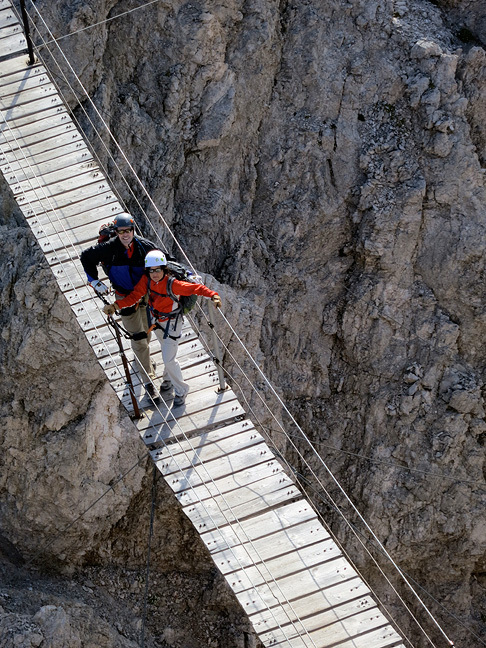 The next morning, one of the first things to do was that famous bridge crossing. Lori gets a shot half-way across. 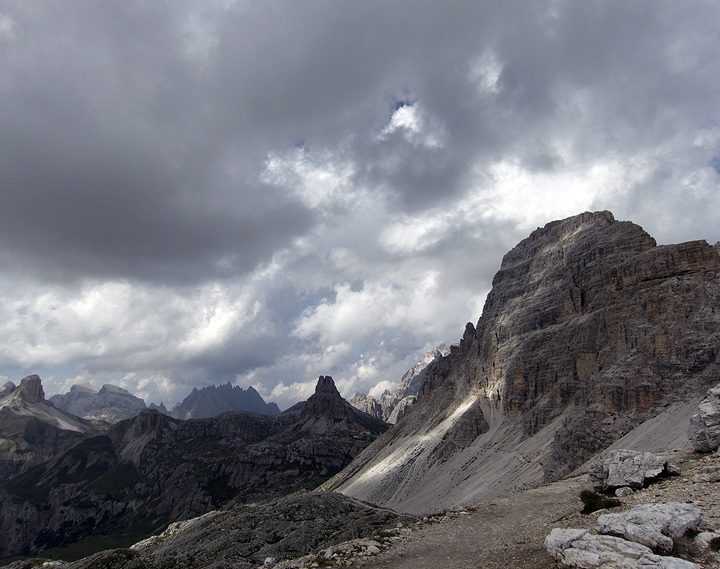 The view back to the Lorenzi hut from our next summit, Cristallo. 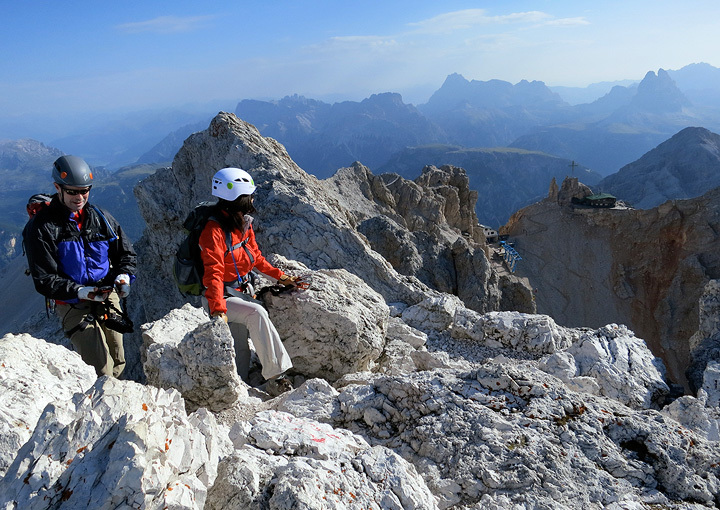 Our route on this day is called the Ivano Dibona, descending 1600 m and who knows how many kilometers, to the road at Ospitale. 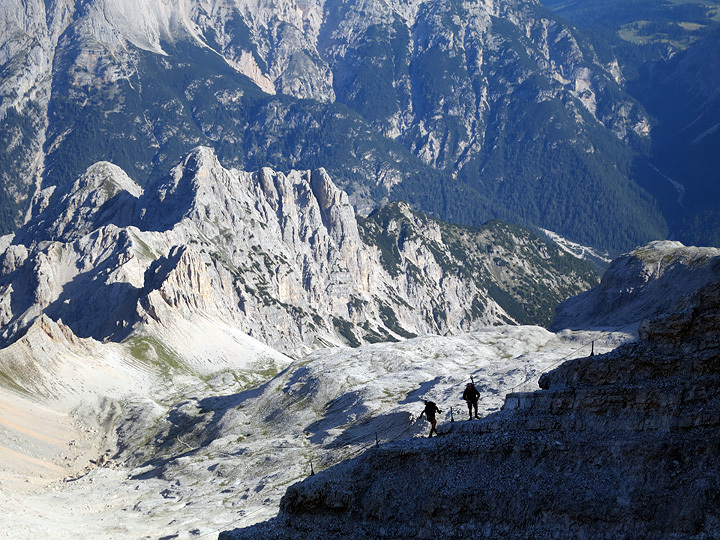 Our hut neighbors skip the Cristallo and continue down the ridge ahead of us. 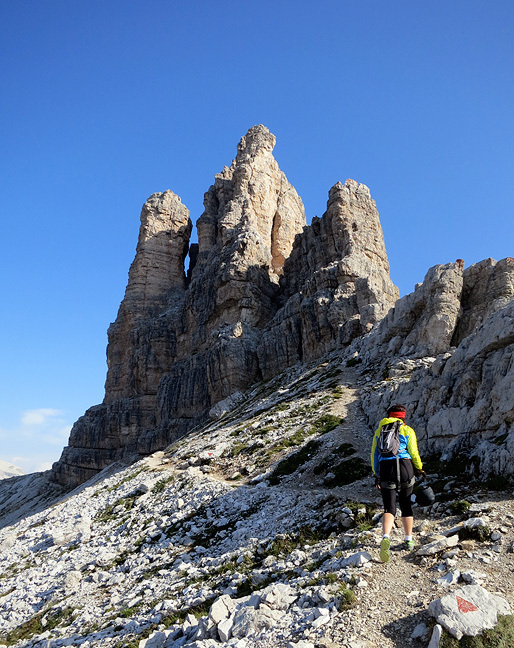 Some of the terrain on the descent of the Cresta Bianca. 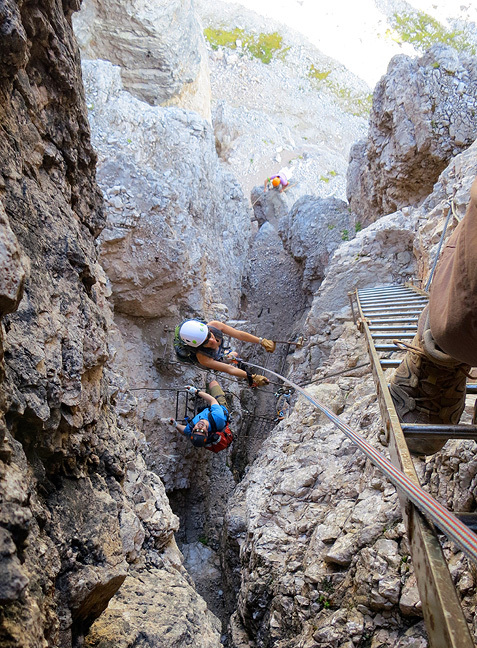 Ferratists traversing exposed ledges below the Vecio del Forame. One of countless poignant reminders of the war, left behind by protagonists. This troop were baseball fans...???? After our long day, we took time for a late morning on day 4. 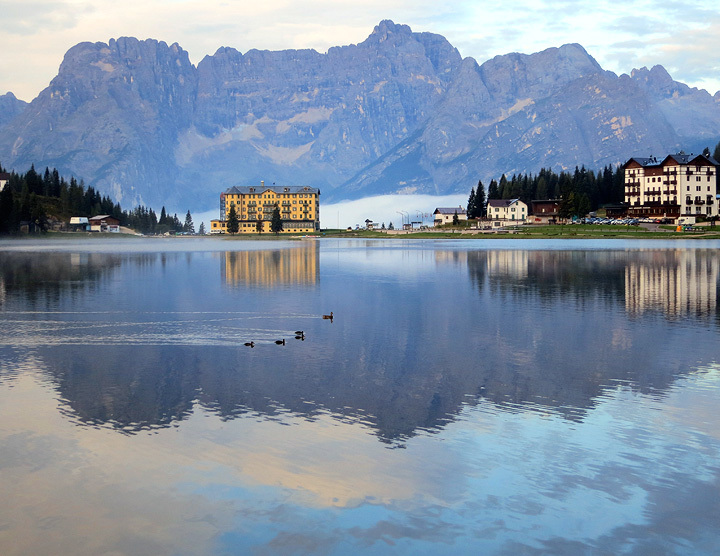 Ducks at sunrise on Lago Misurina. 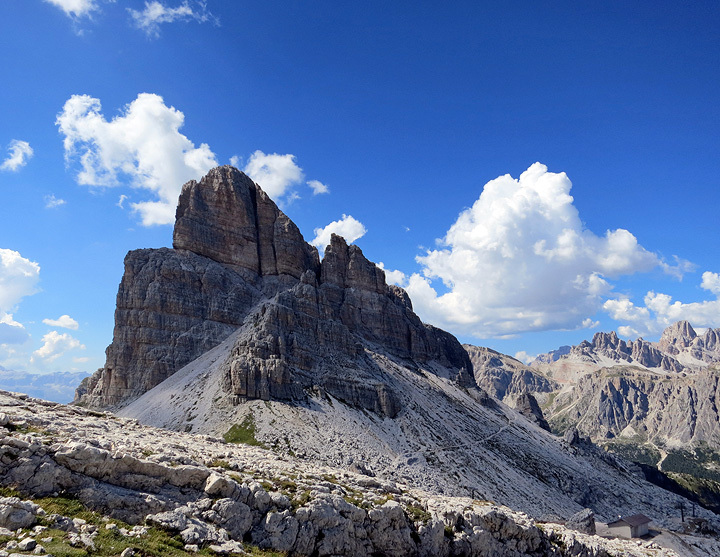 We drove the toll road to its terminus at the Auronzo hut, then walked up into the Tre Cime de Lavaredo playground. 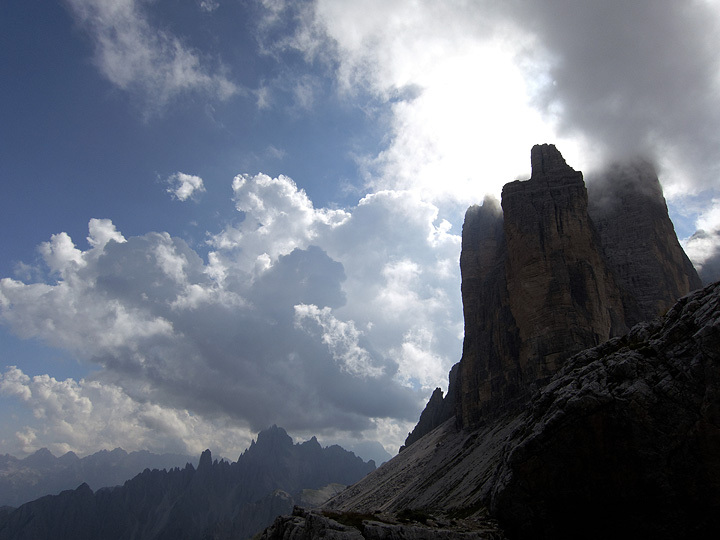 The Tre Cime themselves were in and out of mists on this day. 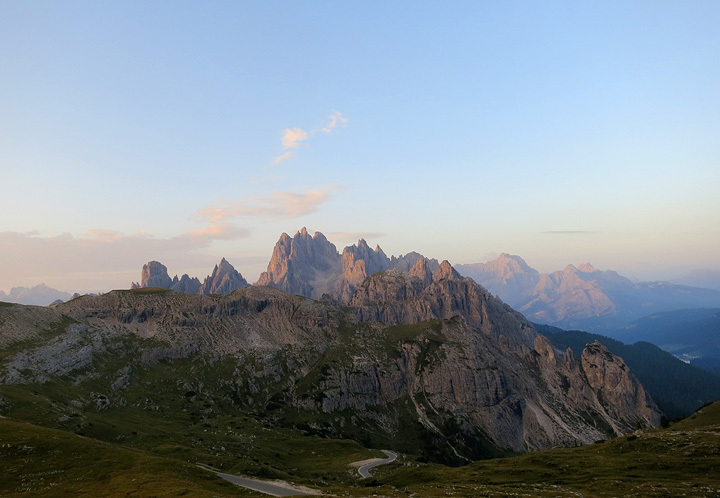 Our goals are Paterno, the bulky peak on the right, and on day 5 we will tackle Torre Toblino, the smaller but pointy summit in the center of this photo. 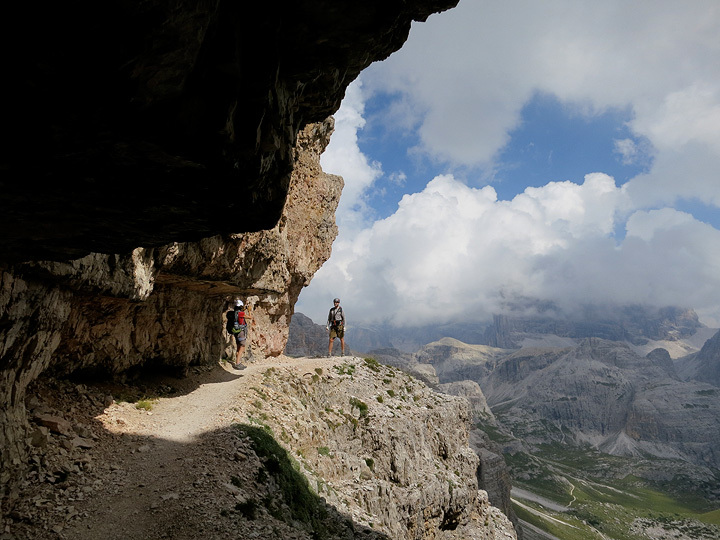 The Innerkofler route on Paterno is famous for, among other things, its 600 meter long tunnel carved steeply into the mountain. A scattering of holes in the wall give some light for part of the way. 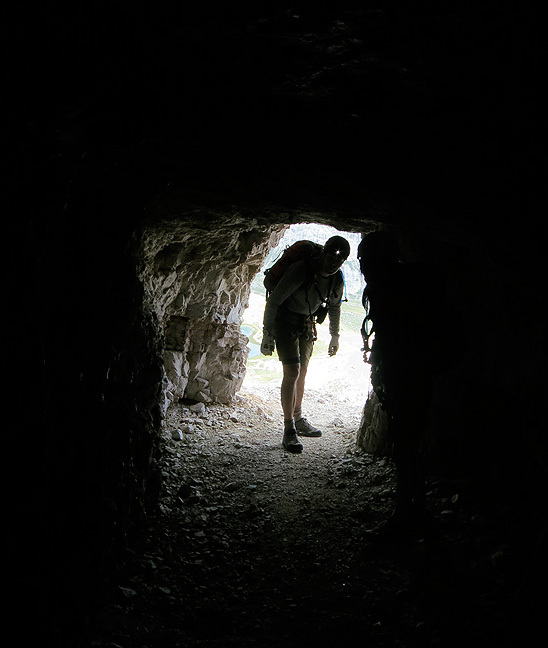 A headlamp is necessary for the upper part, where the "windows" end. Once back in the sunlight, we detoured to the summit of Paterno. The first wall is a steep one. 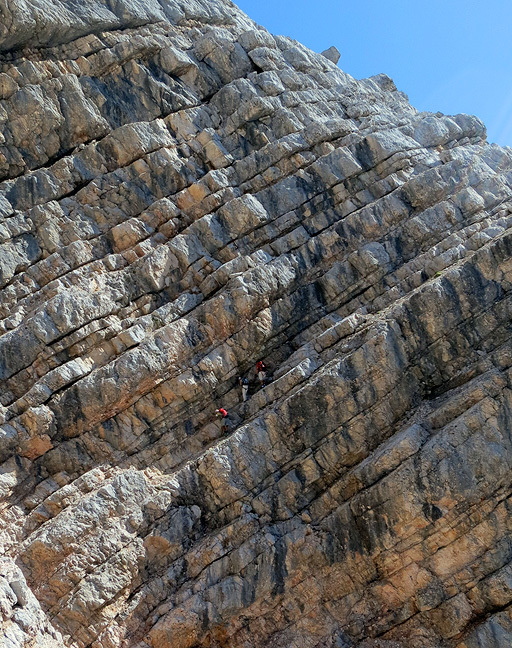 A sense of the steepness and exposure on this exhilarating wall. 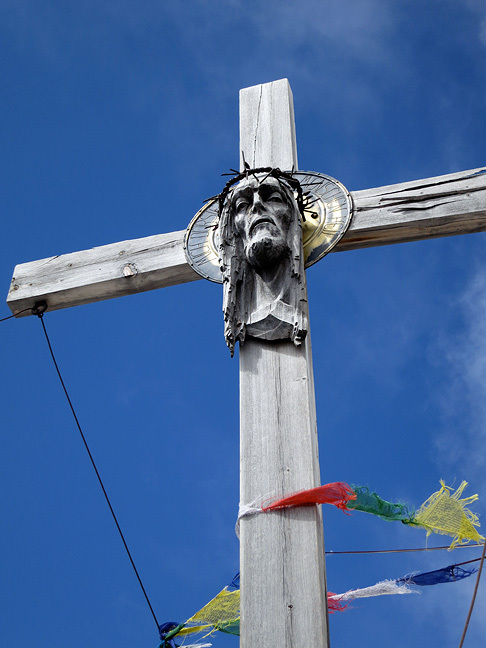 A blend of cultures and religions on the summit. 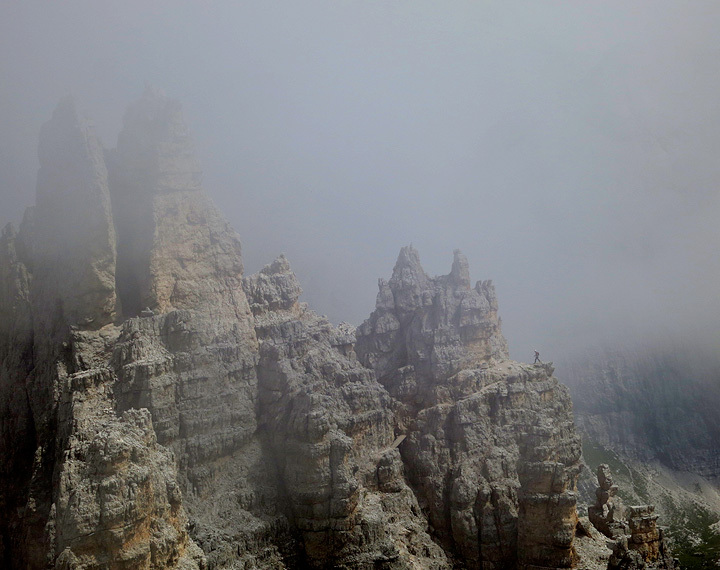 The mists partly hide a connecting route on a nearby ridge. 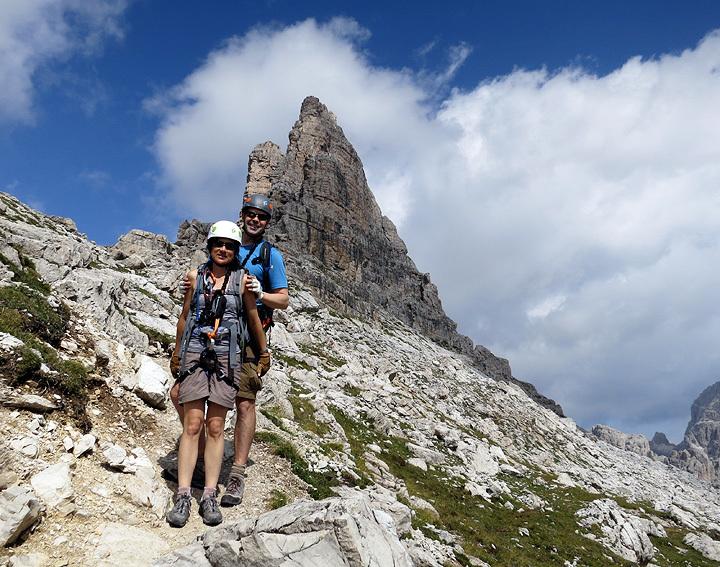 We opted to descend via the extremely scenic, and easier, Sentiero delle Forcella. 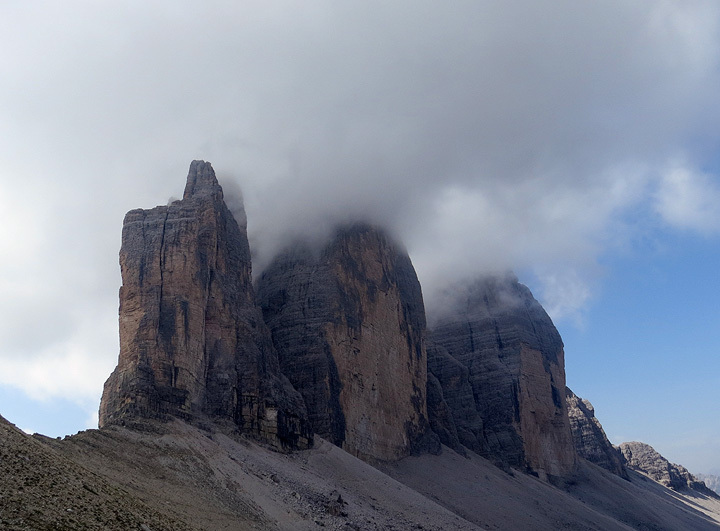 The Tre Cime still flirting with fog as we head back toward the Auronzo hut. Some rare notes of color in this stony landscape. 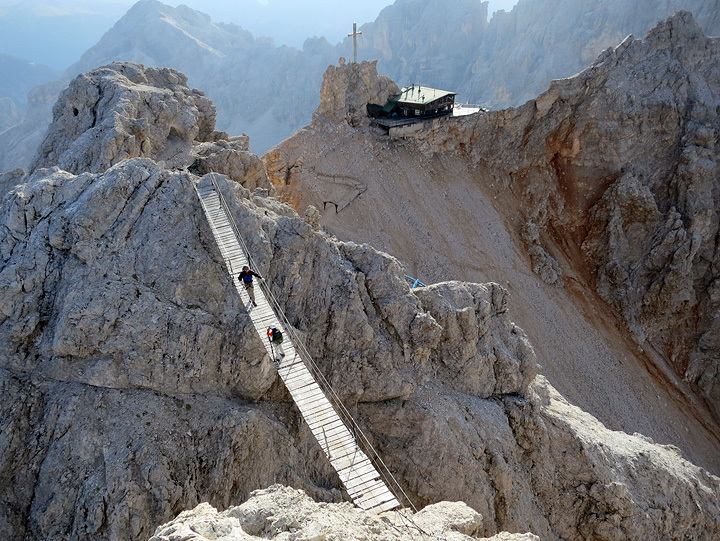 The easy tourist path leads by the Lavaredo hut. 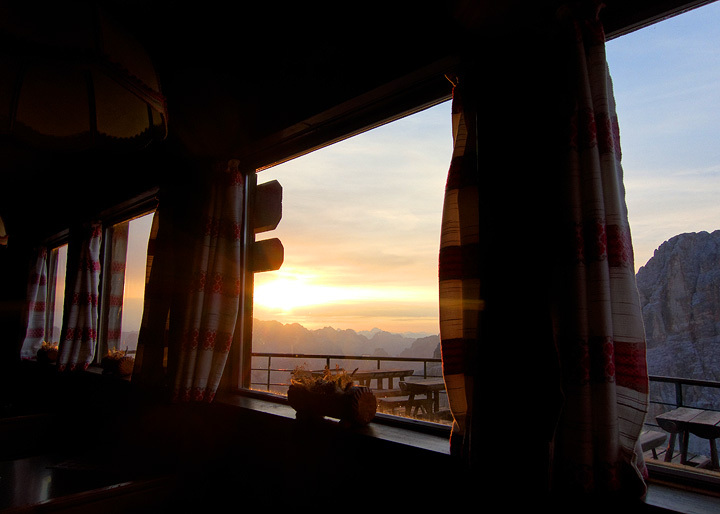 Sunrise the next morning from the Auronzo hut, the weather looks promising still! 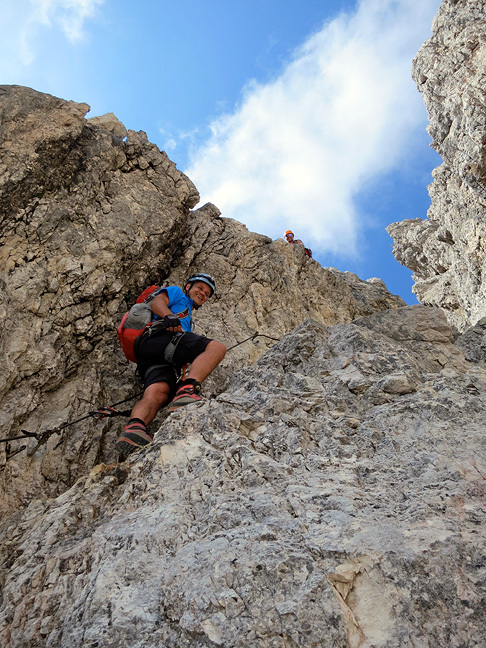 On this, our last day, our goal is the Via Ferrata delle Scalette, on the Torre Toblino. 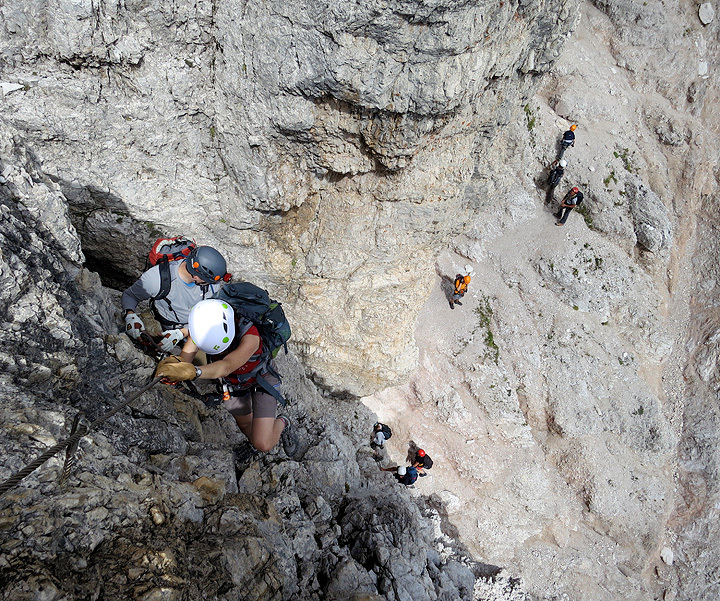 Not a long route, it was nevertheless the most technical and strenuous that we tackled this week. 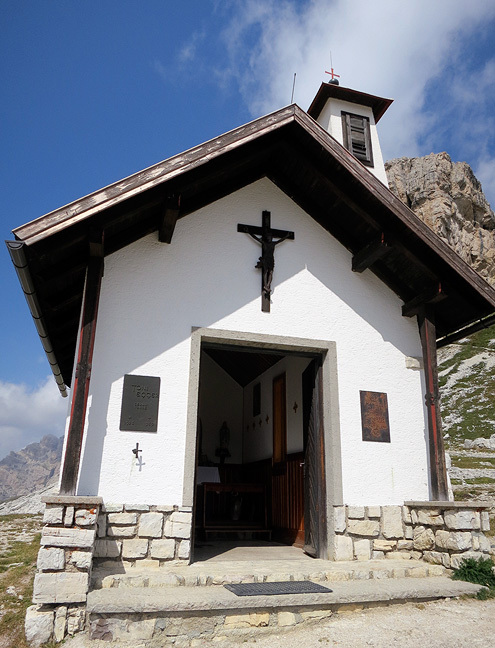 Near the Locatelli hut, a chapel with a memorial plaque to the famous Italian climber Toni Egger of Cerro Torre fame (he died on an attempt of a first ascent on the Patagonian peak). Steep cliffs and ladders follow a series of chimneys on the north side of the peak. A good cool spot for climbing on a hot summer's day! 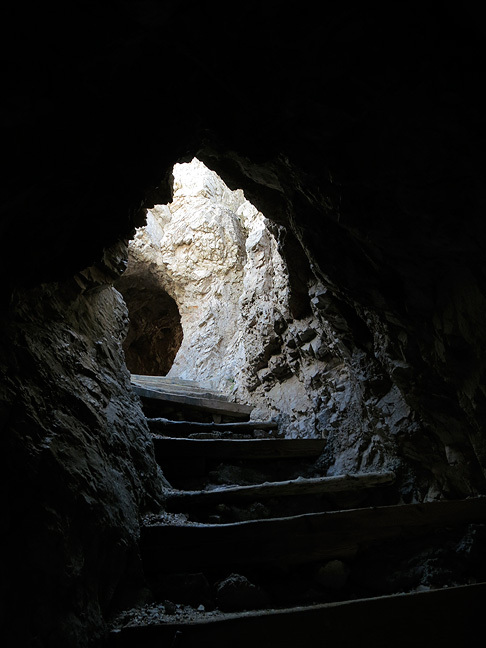 In the middle of the steep ladder section. 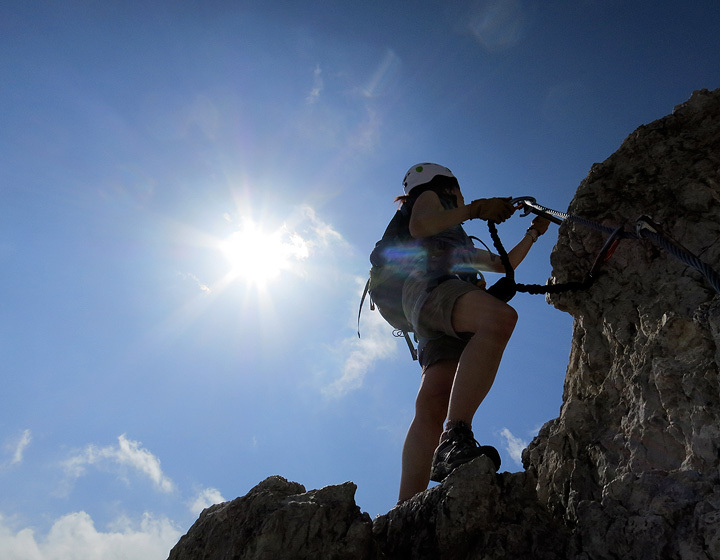 It was an exciting end to a great week of clambering in the sunshine!